> Nashville Newborn Photographer | Holly Marie Photography | Specializing in newborn, baby, toddler, child, and family photography since 2006. Welcome to Holly Marie Photography! Nashville baby and child photographer, Holly Marie Photography – specializing in newborn, baby, toddler, child, and family photography since 2006. Photography sessions take place in her studio or on location – in her clients’ homes, parks, and urban settings in the Franklin, TN area. Serving Nashville, Franklin, Brentwood, TN and the surrounding area. Holly also travels to the Raleigh, NC area for sessions. 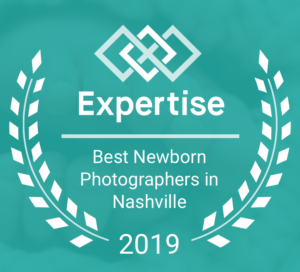 Holly is proud to be recognized once again as one of the Best Newborn Photographers in Nashville by Expertise.com! Click here to be added to the newsletter for updates on scheduling for Tennessee and North Carolina. Nashville newborn photographer, Holly Marie photographs newborns in their home or in her studio. Sessions with a sleeping baby are usually best if completed within the first 2 weeks. Holly is a lifestyle photographer, which means the images from your home session will be natural, unposed and include the home environment and your family. Babies tend to be happier in your arms, featuring that special connection you have. She will also photograph your baby on soft blankets and in the nursery; in the crib, nursery chair, or on a decorative rug. She will bring a few neutral blankets but feel free to lay out some of your own. Blankets that have been passed down or handmade are especially nice and personalize your images. Nashville baby photographer, Holly Marie photographs young non-sitting babies in their home or in her studio. Holly uses blankets or home furniture; such as a chairs, sofas, and cribs with a simple wall as a backdrop. Indoor natural light sessions will need to take place near a window or doorway in a sun-lit room. Artificial light can be added to boost the natural light if needed on a cloudy day or in a dimly lit home. Indoor sessions do not have to be rescheduled due to cloudy or rainy days. Sitting baby and toddler sessions can also take place at an outdoor location. Nashville child photographer, Holly Marie is a natural light photographer, so most of her sessions take place outdoors at local gardens, parks, downtown areas, or in her clients' backyards. When booking a portrait session with Holly, she will help you choose a location that will be the perfect backdrop for your family's images.